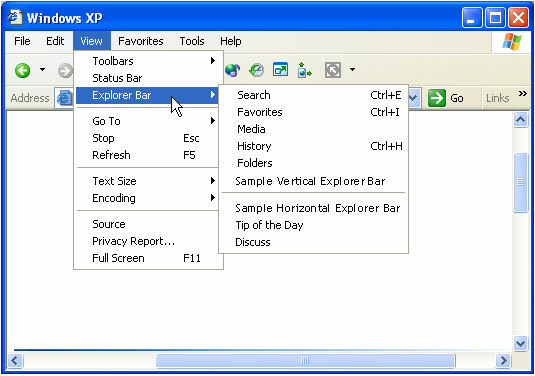 The Explorer Bar was introduced with Microsoft Internet Explorer 4.0 to provide a display area adjacent to the browser pane. It is basically a child window within the Internet Explorer window, and it can be used to display information and interact with the user in much the same way. Explorer Bars are most commonly displayed as a vertical pane on the left side of the browser pane. However, an Explorer Bar can also be displayed horizontally, below the browser pane. A tool band is a band object that was introduced with Internet Explorer 5 to support the Microsoft Windows radio toolbar feature. 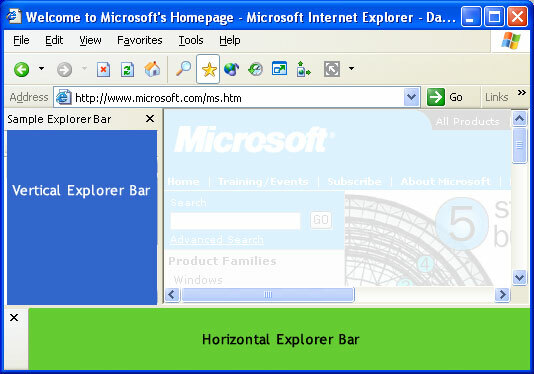 The Internet Explorer toolbar is actually a rebar control that contains several toolbar controls. By creating a tool band, you can add a band to that rebar control. 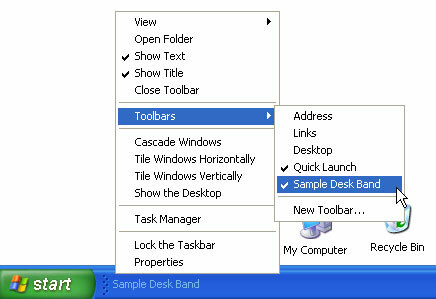 However, like Explorer Bars, a tool band is a general purpose window. Band objects can send commands to their container through the container's IOleCommandTarget interface. To obtain the interface pointer, call the container's IInputObjectSite::QueryInterface method and ask for IID_IOleCommandTarget. You then send commands to the container with IOleCommandTarget::Exec. The command group is CGID_DeskBand. When a band object's err! bad xref: _win32_IDeskBand_GetBandInfo [ambiguous xref; must specify @autoiid, @iid, or @primary.\] method is called, the container uses the dwBandID parameter to assign the band object an identifier that is used for three of the commands. Four IOleCommandTarget::Exec command IDs are supported. The band's information has changed. Set the pvaIn parameter to the band identifier that was received in the most recent call to err! bad xref: _win32_IDeskBand_GetBandInfo [ambiguous xref; must specify @autoiid, @iid, or @primary.\]. The container will call the band object's err! bad xref: _win32_IDeskBand_GetBandInfo [ambiguous xref; must specify @autoiid, @iid, or @primary.\] method to request the updated information. Maximize the band. Set the pvaIn parameter to the band identifier that was received in the most recent call to err! bad xref: _win32_IDeskBand_GetBandInfo [ambiguous xref; must specify @autoiid, @iid, or @primary.\]. Version 5. Display a chevron menu. The container sends an RB_PUSHCHEVRON message, and the band object receives an RBN_CHEVRONPUSHED notification that prompts it to display the chevron menu. Set the IOleCommandTarget::Exec method's nCmdExecOpt parameter to the band identifier received in the most recent call to err! bad xref: _win32_IDeskBand_GetBandInfo [ambiguous xref; must specify @autoiid, @iid, or @primary.\]. Set the IOleCommandTarget::Exec method's pvaIn parameter to the VT_I4 type with an application-defined value. It passes back to the band object as the lAppValue value of the RBN_CHEVRONPUSHED notification. This example goes through the implementation of the sample vertical Explorer Bar shown in the introduction. The complete source code, which also implements a horizontal Explorer Bar and a desk band, is included here for reference. The Explorer Bar sample implements SetSite in the following way. In the following code m_pSite is a private member variable that holds the IInputObjectSite pointer and m_hwndParent holds the parent window's handle. Window creation is handled by the private RegisterAndCreateWindow method. If the window does not exist, this method creates the Explorer Bar's window as an appropriately sized child of the parent window obtained by SetSite. The child window's handle is stored in m_hwnd. //If the window doesn't exist yet, create it now. //Can't create a child window without a parent. //If the window class has not been registered, then do so. //If RegisterClass fails, CreateWindow below will fail. //Create the window. The WndProc will set m_hWnd. There are two IOleWindow methods: GetWindow and ContextSensitiveHelp. The Explorer Bar sample's implementation of GetWindow returns the Explorer Bar's child window handle, m_hwnd. Context-sensitive Help is not implemented, so IOleWindow::ContextSensitiveHelp returns E_NOTIMPL. The remaining method, err! bad xref: _win32_IDeskBand_GetBandInfo [ambiguous xref; must specify @autoiid, @iid, or @primary.\], is specific to IDeskBand. 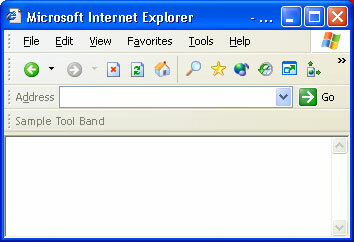 Internet Explorer uses it to specify the Explorer Bar's identifier and viewing mode. Internet Explorer also may request one or more pieces of information from the Explorer Bar by filling the dwMask member of the DESKBANDINFO structure that is passed as the third parameter. err! bad xref: _win32_IDeskBand_GetBandInfo [ambiguous xref; must specify @autoiid, @iid, or @primary.\] should store the identifier and viewing mode and fill the DESKBANDINFO structure with the requested data. The Explorer Bar sample implements err! bad xref: _win32_IDeskBand_GetBandInfo [ambiguous xref; must specify @autoiid, @iid, or @primary.\] as shown in the following code example. // TODO: Add error handling code here to check the hr return value. //Use the default background color by removing this flag. As with all COM objects, the Explorer Bar's CLSID must be registered. For the object to function properly with Internet Explorer, it must also be registered for the appropriate component category (CATID_InfoBand). The relevant code section for the vertical Explorer Bar is shown in the following code example. //Register the Explorer Bar object. //Register the component categories for the Explorer Bar object. 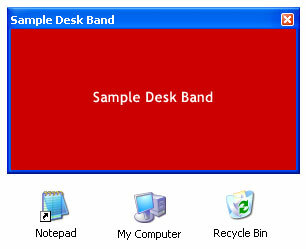 Registration of band objects in the sample uses normal COM procedures and is handled by a private function, RegisterServer. //Inform the input object site that the focus has changed.